Apple's supply chain are said to be gearing up for mass production of the long-rumored next-generation MacBook Air with a high-resolution Retina display, according to a new rumor. 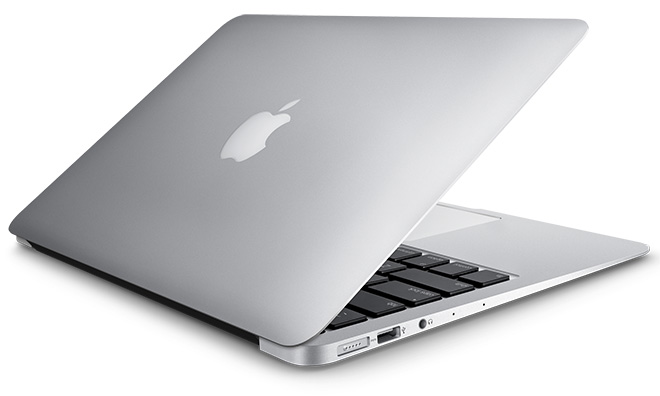 The new 12-inch MacBook Air is alleged to begin mass production in the first quarter of 2015, according to DigiTimes. While the publication does have a poor track record with respect to Apple rumors, the timing does make sense, as Intel's next-generation low-power Broadwell processors are set to become available early next year. Monday's report claimed that the new MacBook Air with Retina display will indeed feature Intel's Broadwell, along with a new chassis that's expected to be thinner and lighter than ever. According to the usual unnamed supply chain sources, it was said that mass production has been "hampered by low yield rates." With yield issues being "gradually resolved," mass production of the ultrathin portable is expected to take place next quarter. The report said the notebook, expected to be built by Quanta computer, will target the high end and will have limited shipments. Reports originally suggested that Apple's 12-inch Retina MacBook Air would launch this year, but production was allegedly delayed after Intel's Broadwell chips were late to the market. The notebook is believed to be heavily dependent on Intel's next-generation 14-nanometer chips for its unique design. According to analyst Ming-Chi Kuo of KGI Securities, the next-generation MacBook Air is expected to feature a stripped-down 12-inch form factor with a fan-less design, fewer inputs and outputs, and potentially a click-less TrackPad. The existing MacBook Air lineup was given a minor speed bump in April with a minor speed bump and accompanying price cut. The current MacBook Air lineup comes in two screen sizes of 11.6 and 13.3 inches. In addition, Monday's report also alleged that Apple's supply chain is gearing up for production of the Apple Watch. Apple has already said that its wearable device will debut in early 2015.